When I look at your heavens, the work of your fingers, the moon and the stars that you have established, what are human beings that you mindful of them, mortals that you care for them? Even though we are tiny, as tiny as a marble, in the scope of the universe, God cares for each and every one of us, I said. God counts the hairs on our heads. I looked out over the congregation and then peered into my bag of marbles. On the spur of the moment I realized I had enough to hand out to everyone. I turned to the kids and put a few marbles in each of their hands. Please give them to all the adults, I said. The kids scooted sideways through the narrow country church pews, placing the marbles into the hands of their grandparents and cousins, their aunts and neighbors. I reminded the adults that they too are children of God, blessed and beloved. And now here in this hospital room was one of those marbles, comforting this woman as she headed into the unknown. That is the beauty of collaborative learning at Wartburg Theological Seminary. Things taught in class one day often quickly end up as part of sermons, Bible studies, confirmation lessons and pastoral care. My pastoral role is fed day by day, week by week, semester by semester, by the classes I take, by the professors who guide them and by my classmates who walk with me. As a collaborative learner, I am a full-time Masters of Divinity student while serving in the pastoral role for the three-point parish that is Southwest Iowa Ministries (SWIM). The churches – Strand, Bethesda and Tabor Wallin – are ELCA churches with Swedish roots. They are all more than 150 years old. Their white spires tower above the surrounding cornfields and gravel roads, and their creaky wooden pews are filled with generations of families. They are proud of their heritage and traditions. Recently my Wartburg faculty advisor, Dr. Kris Stache, spent a weekend visiting with me and the members of these congregations to learn more about this ministry context and life in southwest Iowa. Over the years, the three SWIM churches hosted many pastoral interns when it was led by an ordained pastor. Norma Jean Mosman, a member of Strand Lutheran Church for the past 64 years, has thoroughly enjoyed being a church served by interns and student pastors. SWIM does not currently have an ordained staff member, so hosting interns is not currently an option. But in February of 2017, they agreed to take me on as a student pastor. Taking a full class load and serving in this role with three churches is busy. Sometimes, it’s overwhelming. It helps that SWIM church members are flexible and understanding and forgiving of mistakes. They are more self sufficient than any other church I’ve ever experienced. They are willing to try new things, to experiment. They invite new ideas. I am keenly aware of how wonderful this is. I also have the support of two nearby pastors. 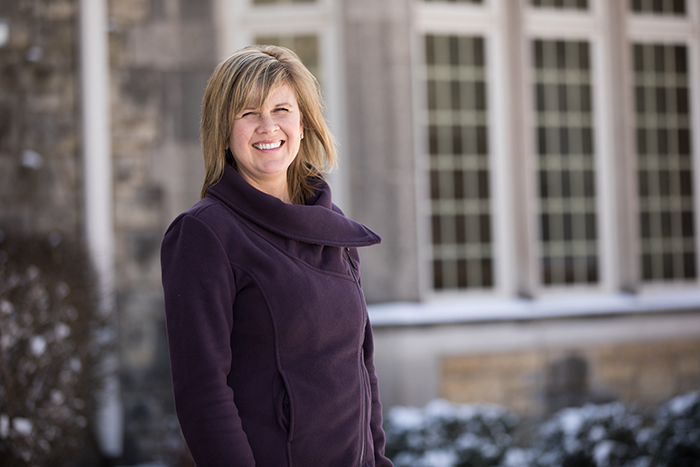 Pastor Carla Johnsen of Saint John in Dunlap, Iowa, and Bethesda in Moorhead, Iowa, is my supervisor. She and I meet almost weekly to discuss a wide variety of topics, from sermon content to confirmation lessons to church budgets. Pastor Jon Benson, who serves Saint John in Council Bluffs, is my mentor. He is endlessly patient and always available to wrestle with theology, worship planning and anything else that comes up. Going to class in “real-time” online is interesting. When I try to describe it to people I use phrases like “I Skype in” and “it’s like a Brady Bunch screen” in the classroom. Often people don’t quite understand. That’s OK. It feels good to think of Wartburg as on the cutting edge. A couple more years and this type of learning will make sense to everyone. In the meantime, my classmates and I take full advantage of this technology offered. 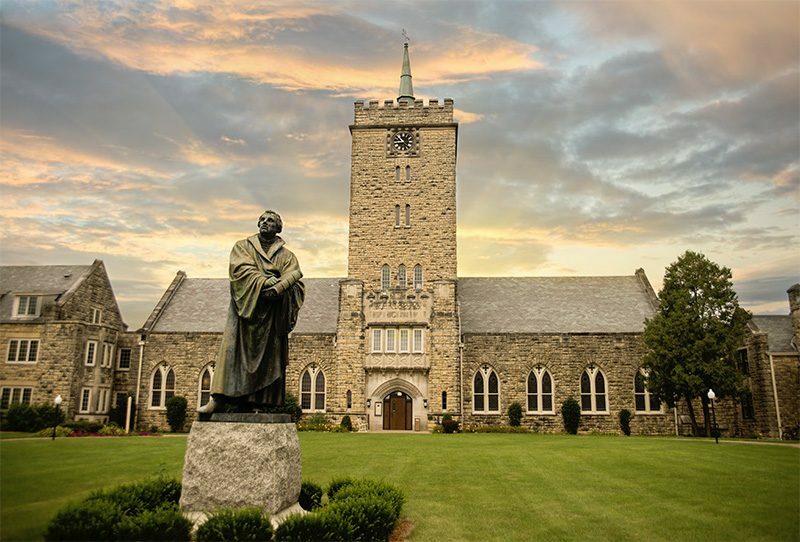 From our screens at home we can talk to classmates and instructors on campus, ask and answer questions during class each day – I may be sitting in my dining room in Glenwood, Iowa, but my brain and my heart are often in Dubuque wrestling with theology, New Testament exegesis and the poetry of pastoral care. Dr. Stache’s visit to southwest Iowa was a bridge between these two worlds. 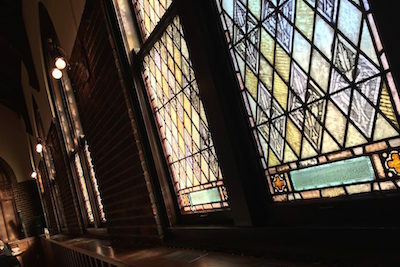 For so many years, seminary students had come from Wartburg to southwest Iowa to serve during their internship years, but no one could recall a faculty visit. The new collaborative model, with support from a grant from the Association of Theological Schools, made a visit possible. During and after Dr. Stache’s time in southwest Iowa, congregation members remarked over and over how wonderful it was to put a face with the institution. During her time with us, Dr. Stache and I visited each church so she could see the physical buildings. We also spent about an hour with a group of congregation members from each church. We talked a little bit about the history of each church and the makeup of the congregations. 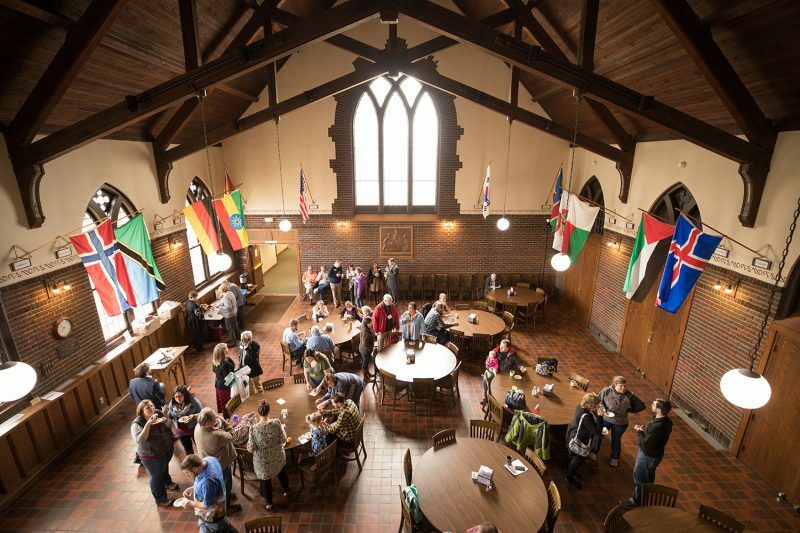 And we pondered how Wartburg could help the churches continue to serve as valuable teaching and learning congregations, and how the church members could further help Wartburg understand congregations and live into their callings as partners in theological education.